The future has changed, and definitely for the better this time. Forget the old future with its Buck Rogers pajamas, robots with flashing lights for eyes and ray guns that go ee-oop! ee-oop! The new future, as envisioned by General Electric’s Consumer and Industrial division, is decidedly low-impact: the style is tasteful minimalism, with sculptured metal handles and brushed steel surfaces that will allow America’s most venerable appliance maker to stand shoulder-to-shoulder with glam European brands. Above all, GE’s Kitchen of the Future is smart. Ask about the weather while still rubbing the sleep out of your eyes, and a synthesized voice tells you there’s a chance of rain. What should you make for dinner? The stovetop inspects the contents of the fridge—is anybody ever going to finish that left-over Thai food?—and suggests, via cell phone, a list of entrées that can be made from what’s around the house. Or, it can call your reliable spouse to tell him or her to buy two bottles of wine—one for the coq au vin, the other for the table. Don’t worry about the spilled liquid on the stovetop: the cooking surface cleans itself. And, as often as not, the kitchen thinks for itself. The dishwasher determines the exact amount of both water and detergent needed to scrub the pots. At the same time, the slim, wall-mounted water heater ensures a hot shower without a tank, while cutting energy costs by 25 percent. This mythical kitchen is the brainchild of Paul Klein, GE’s general manager of brands and advertising and his co-workers’ appliances unit in Louisville, Kentucky. The idea behind the Kitchen of the Future envisions a way to redefine cooking for the Information Age, with instructions flowing from human to machine—and vice versa. “It’s a lot like a concept car at an automotive show, which is about ideas,” Klein says about the Kitchen of the Future. Like Plato’s Heaven or the pretty girl pursued by the amorous lover in Keats’ ode, GE’s Kitchen of the Future is an ideal that can be approached but never fully attained. If unattainable, the imaginary kitchen remains a source of both ideas and inspiration for Klein and his staff of industrial designers and engineers. 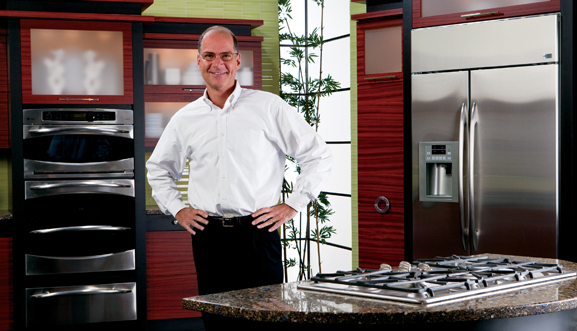 Klein’s R&D efforts focus on what he calls two “fundamental aspects” of the kitchen. The first is communications. “We want to combine innovation in cooking technology with communications,” he says. GE’s Cafe Kitchen Suite. Courtesy of GE. Another form of communication would be a line between the dishwasher and the water heater and the power company. The utility provider can inform the appliances which times of day have the cheapest electricity, thereby minimizing the high cost of running the dishwasher or defrosting the fridge during peak hour. The second goal of GE’s kitchen futurism is to make life easier. To design appliances with that goal in mind sometimes means to reinvent how they are operated. “A lot of appliance controls get outdated, but their basic functionality does not,” he says. “The PC you had in 1998 is a museum piece.” New kitchen technology, Klein continues, is “how we can make the use of appliances easier and you save time.” The ultimate purpose, he says, is to add to the pleasure of cooking, which can boost individual passion or provide a way of spending time with family. More innovative is GE’s proprietary Advantium oven, which combines high-powered lights with microwave energy. According to the manufacturer, the Advantium oven can cut cooking times by up to 80 percent. “For searing or browning food, it’s unbelievable,” says Klein of the speedcooking oven. At the same time, the ability to use preprogrammed recipes in the oven means that the Advantium oven is safe for unattended cooking, he adds. When dishes must be washed, a feature on the Profile dishwasher measures the exact amount of detergent needed for a particular load, while taking into account the “hardness” of local tap water.